Meat simmers over an open kettle at the Yoders’ annual butchering day. Homemade, hand-made sausage rolls off a conveyer belt, enough sausage for each church family for the year ahead. Gloria’s husband Daniel skillfully cuts the meat. Soon it was time for everyone to go back to the stations they had been assigned to. Something new this year that one of the guys invented was a grinder with a head that pushed the meat out in long flat strips. These strips were then cut, every couple inches, resulting in a nice square hamburger shape. With the seasoning being mixed in earlier, they were now ready to be frozen, then thawed and placed straight onto the grill. Packaging was my primary job, next to taking care of the children of course. This year most of the meat was vacuum sealed to help keep it fresh longer. Though the boys are the ones responsible for the stuffing, I am always fascinated by it. 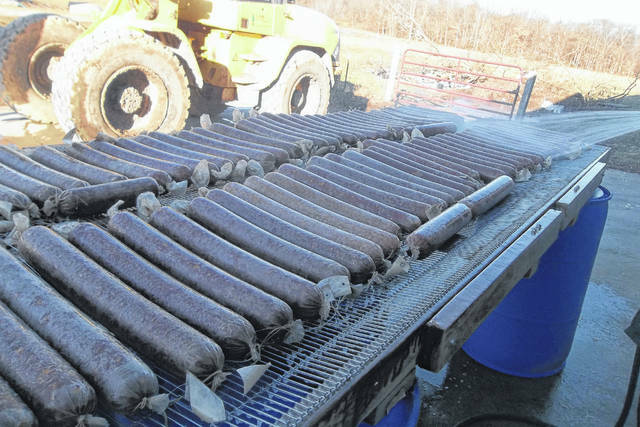 Large home-fabricated stuffers work well to stuff hundreds of pounds of meat efficiently. After the bologna has smoked for a couple hours, it is the wheeled outdoors on a cart that’s been made for that purpose, holding up to 250 pounds. The sticks of bologna are then placed side by side on a large table and sprayed with cold water to help cool them down to where they can then be placed in vacuum bags, ready for the freezer. And for interest’s sake, yes we do have freezers, run by generators, solar power, or for folks like us, from the diesel that runs the shop equipment. By noon everyone is ready for a break, though we were all snacking throughout the morning on the delicious assortment of homemade cookies, salty snacks, tea, and coffee. While we had all helped furnish food, those on the food committee took responsibility for it to be ready and served. After short break jobs were once more resumed. Never do I see stacks and stacks of dirty dishes as I do on butcher day. When you think you’re about done another stack of greasy buckets, more knives, or yet another pile of bowls are about to be set on the table to wash. Not to mention all the grinders, tables and the likes that required their fair share of scrubbing to have all the greasy residue removed. Large pieces of plastic or tarp are taped down onto the floor before all the butcher equipment get moved in, simplifying floor clean-up. 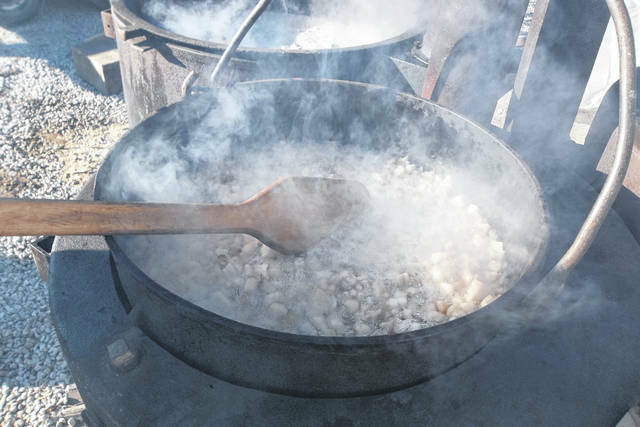 https://www.recordherald.com/wp-content/uploads/sites/27/2019/01/web1_102_2167.jpgMeat simmers over an open kettle at the Yoders’ annual butchering day. https://www.recordherald.com/wp-content/uploads/sites/27/2019/01/web1_102_2174.jpgHomemade, hand-made sausage rolls off a conveyer belt, enough sausage for each church family for the year ahead. 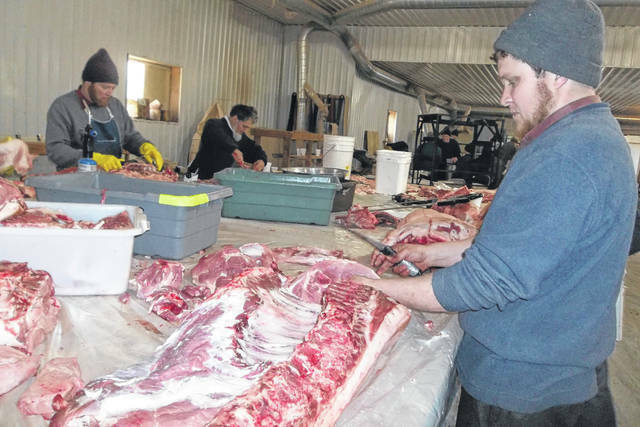 https://www.recordherald.com/wp-content/uploads/sites/27/2019/01/web1_102_2181.jpgGloria’s husband Daniel skillfully cuts the meat.